Heat oven to 400°F. Sprinkle both sides of the chicken pieces with seasoned salt and cayenne pepper. Place chicken in large resealable plastic bag placed in large bowl. Pour 2 cups of the buttermilk over chicken. Seal bag; refrigerate 1 hour or overnight. Line a 13x9-inch shallow baking pan with foil. Place a cooling rack over pan; generously spray cooling rack with nonstick cooking spray. In medium shallow bowl, mix eggs with remaining buttermilk; whisk until smooth. Place Bisquick mix in small shallow bowl. Place cereal in another small shallow bowl. 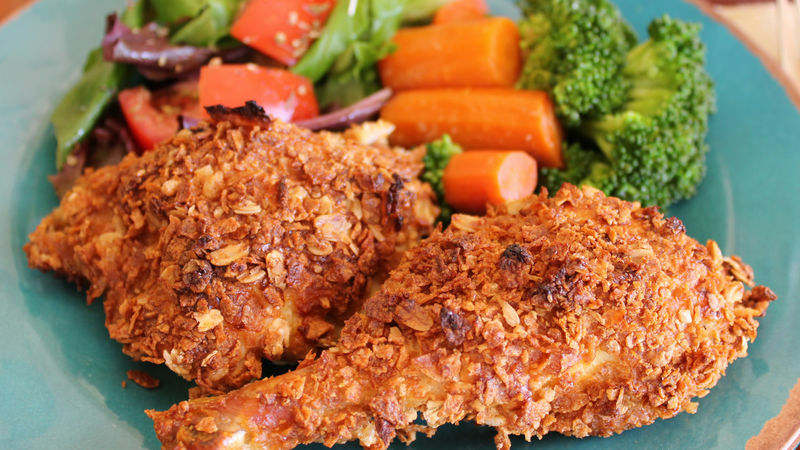 Remove chicken pieces one at a time from the buttermilk; dredge in Bisquick mix, then egg wash, then cereal, coating chicken pieces completely. Place chicken pieces, bone sides down, on rack. Spray top of chicken with cooking spray. Bake uncovered, on middle oven rack, for about 50 minutes or until juices run clear. For a leaner version of this recipe, remove skin from chicken before marinating chicken pieces in buttermilk. Substitute egg whites for whole eggs and use low fat buttermilk.